(Nanowerk Spotlight) Materials engineers are keen to exploit the outstanding mechanical properties of carbon nanotubes (CNTs) for applications in fibers, composites, fabrics and other larger-scale structures and devices. The ability to fabricate continuous, multifunctional yarns represents an important step in this direction. The development of a continuous, weavable multilayered CNT yarn with superior mechanical, structural, surface, and electrical properties would open the way for a wide range of structural and functional applications, including composites, intelligent fabrics, catalyst supports, and sensors. Carbon nanotube yarns have already been studied extensively, but these previous studies were on straight yarns (see for instance: "Spinning kilometers-long, multi-layered carbon nanotube yarns") which are a relatively simple structure and tend to break when stretched to a small degree. Their applications are also limited due to a lack of elasticity. Researchers in China have now found that carbon nanotubes can be self-assembled into a stable double-helix structure by a controlled over-twisting process, and this novel structure has unique mechanical properties. 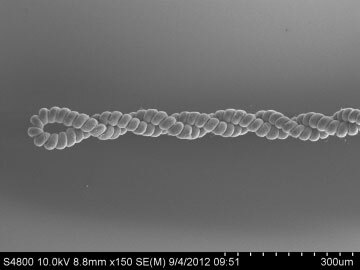 Reporting their findings in the December 30, 2012 online edition of ACS Nano ("Highly Twisted Double-Helix Carbon Nanotube Yarns"), they show that a controlled yet simple spinning method can produce two-level helical yarns (more complex high-level is also possible). "We wanted to modify the yarn structure to enable multi-functionality, and extend the application areas," Anyuan Cao, a professor in the Department of Materials Science and Engineering, College of Engineering, at Peking University, tells Nanowerk. "We therefore adopted the strategy of over-twisting helical loops to bring new properties and more functions to the nanotube yarns." These twisted CNT yarns enable many new properties such as super-stretchability, elasticity and spring-like behavior, with potential applications in various fields. The double-helix structure also resembles the morphology of natural biological species such as DNA. These properties are not available from non-helical, straight yarns. The team, which was led by Cao and Professor Yibin Li from the Harbin Institute of Technology, fabricated double-helix CNT yarns by continuously spinning a single-walled nanotube film through two overtwisting steps. "While we modified the straight yarns into double-helix, the material elasticity was greatly enhanced, however, there were stress concentrations existing in the double-helix caused by yarn looping and over-twisting," Cao describes a challenge of their fabrication process. "This resulted in lowered material strength and sometimes the double-helix broke before fully stretched, due to such stress concentration." Possible methods to alleviate this problem include 1) improving the material quality of initial carbon nanotube film for spinning in order to get more uniform and stronger yarns; 2) controlling the yarn diameter and the double-helix pitch to investigate the effect on stress concentration; and 3) some post-treatments such as thermal annealing and polymer reinforcement to further improve the yarn property. In their paper, the researchers demonstrate potential applications for this CNT yarn that include stress or strain sensors (double-helix resistance changes with applied strain linearly), photo detectors, and thermocouple-like devices because of the double-helix yarn's response to environmental temperature. They anticipate future applications that include electromechanical actuators, energy-absorption or impact-resistant ropes, fiber-shape devices and elastic electrodes for energy-related devices such as solar cells and super-capacitors. Going forward, the team plans to study the self-assembly process to fabricate higher-level and more complex double-helix-based structures, and explore their new properties and applications. "It would be useful if we can model the mechanical behavior of such complex structure combining experimental results," says Cao. "One potential challenge is the increased difficulty in controlling the spinning process for more complex hierarchical structures. Now we have the double-helix, but how we can make a triple-helix or helix meshes in easy way? So once we find an interesting structure, we need develop a reliable and simple process for manufacturing."